I don’t think highly enough of myself to kick off this blog with a review of a Guerlain classic because I feel I’m particularly versed in olfactory luxuries. I just wanted start with a relatively agreed upon fragrance. A classic, in other words, where so many others have said what needed to be said and I’m just filling in an already overflowing gap. Mitsouko is Guerlain’s 1919 debut girl. Formulated by Jacques Guerlain with a following that describes her with such words as deep, sensual, sophisticated, and mysterious. In Bottle: The fragrance is so well blended that I have a hard time picking out any specific notes. This is not a bad thing as it means Mitsouko has that unique quality. She smells like something never smelled before. I immediately associate her with with the word ‘classic’ and ‘old world’. Old world being a very endearing term to me, of course. It’s spicy, it’s woodsy, just a little floral and very lightly fruity, but it’s all of those things at once too. To separate the notes and describe them feels wrong. Applied: Mitsouko’s initial application is a burst of complex florals and soft woodsy notes. In a manner of seconds, as if she shed her flower coat as she drifted from the air onto skin, Mitsouko begins to deepen. The woods and spices come up creating this miasma of scent that makes me think darkness, headiness, and shadows drifting in and out of a sunless forest. As she dries the woods and moss come up more, blending with the spices as the components practically meld together. It is easy to forget that this is a fragrance composed of different notes and the fruitiness that people love in this fragrance is the softening agent used to tame rather than dominate. It’s hard to separate the notes and what’s left is just Mitsouko as a whole. Extra: So it is said that Guerlain’s Mitsouko is a homage to many things, the name, the novel, the woman herself. Most people seem to subscribe to the theory that Guerlain based Mitsouko on the novel, La Bataille by Claude Farrčre. Where the novel is now difficult to find, at least for an English speaker with no foothold in French, the fragrance lives on in those who continue to love her. 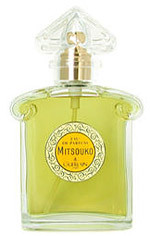 Design: Mitsouko’s bottle design, I suspect, is supposed to reflect its scent and the artistry of the time. It looks and feels like a piece of design history. It’s a piece that, to me, reflects the orientalism of the fragrance and while art and design has since evolved into abstract shapes, clean and sharp lines, with flowing bulbous nodes of color bold against white, Mitsouko’s bottle design is an echo from an era gone but never forgotten. The one thing about my bottle I dislike is the plastic cap which seems to be on par for most recent Guerlains. I would have liked for them to invest in some nicer caps but you can’t have it all. Notes: Citrus, rose, peach, clove, pepper, spices, oakmoss and woods. I believe a modern fragrance lover, and I wholly admit myself as a rotten, no-good, fruity-floral loving modernist, would find it difficult to like Mitsouko. But liking and respecting are two different things to me. I own a bottle of Mitsouko, a small one, for the simple fact that it is a piece of fragrance history. Once in a while I’ll bring her out and try to analyze the complexities of her nature and to assuage my guilt of not warming up to Shalimar yet (I’m getting there). I find her too deep for normal wear as the people I’m around most often tend to react poorly to her. It’s not their fault, and it’s not Mitsouko’s fault either. Mitsouko is to be appreciated for sure as one of those classics you’ve just got to try at least once because reviews just don’t do her justice. As for wearing her? That depends on what you like. Reviewed in This Post: Mitsouko, circa 2008, Eau de Toilette. This entry was posted in chypre, classic, guerlain, oriental, Reviews By House, spicy and tagged chypre, citrus, clove, florals, fragrance, fruitiness, guerlinade, oakmoss, peach, pepper, rose, spices, woods. Bookmark the permalink.